Compare discounts for Hotels Motels in Indianapolis, Indiana! Indianapolis, or Indy, as it is nicknamed, the nation's 12th largest city, is attracting more than 18 million visitors a year. Indianapolis is the sporting Capital of Indiana and one of the more 'Sport Oriented' cities in America. Home to the Indiana Pacers, Indianapolis Colts, Indianapolis Indians and Indiana Ice - professional sport action is always present in town. Indy also claims fame by hosting the world renown Indy 500, NASCAR Brickyard 400, and NHRA US Nationals. Indianapolis is also famous for its educational attractions, which include Holcomb Observatory and Planetarium, Indianapolis Zoo, Children's Museum, Conner Prairie, President Benjamin Harrison's Home, Indianapolis Basketball Hall of Fame, Indiana State Museum, Indianapolis Motor Speedway Sports Museum, and Indiana Medical History. In the heart of the Midwest, Indianapolis is known as 'Crossroads of America' with Interstate highways spanning from downtown to every possible direction. Note: Lists are not identical. 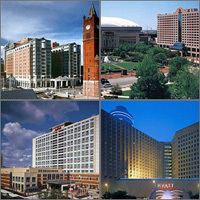 Different sites offer different accommodation options for Indianapolis. A registered historic landmark, the Canterbury Hotel is located in the heart of downtown Indianapolis. The elegant Omni Severin Hotel luxury hotel has been recently restored to its original grandeur, and offers the most contemporary amenities while maintaining the charm of its 1913 construction. Rising 20 stories above downtown Indianapolis, the imposing Hyatt Regency Indianapolis hotel features a soaring, light-filled atrium, revolving rooftop restaurant, and enclosed skywalks that connect it to the Indiana Convention Center and Circle Centre mall. Connected to the Indiana Convention Center and RCADome, the Indianapolis Marriott Downtown is just blocks from Circle Centre Mall, Conseco Fieldhouse and the Indiana state capitol building. The Adam's Mark Indianapolis Airport offers a great location close to the speedway, airport, convention center, and downtown. Downtown Indianapolis is eight miles west of this five-story hotel, which is convenient to major highways. The Marriott Indianapolis North is located off I-465, within 30 minutes of the airport, downtown Indianapolis, and the convention center. The Radisson Hotel Indianapolis Airport is located just minutes from downtown and steps from the airport. Looking like a a Spanish castle, the Embassy Suites Indianapolis North is conveniently located half a mile from 'Beef and Boards' dinner theater and the Pyramids at College Park. The Ramada Indianapolis Airport is a first-class hotel located one half mile from Indianapolis International Airport, conveniently located to Indianapolis Motor Speedway, RCA Dome and Convention Center, Children's Museum and Indianapolis Zoo. The Wingate Inn Indianapolis Airport offers complimentary Continental Breakfast, free Airport Shuttle and is located only 10 Minutes from Downtown Indianapolis and 3 Miles from the Indianapolis Motor Speedway. Located less than two miles from Indianapolis International Airport, La Quinta Inn Indianapolis Airport is a two-story hotel that combines convenience with comfortable rooms, courteous service, and a daily complimentary Continental Breakfast.